This 1970s reproduction blouse is absolutely beautiful in person. I haven't figured out my new digital camera so I wasn't able to capture the sparkle and beauty of the fabric. It possesses many colors which blend well together. The coloring is not quite as bold as above. It is a bit lighter. 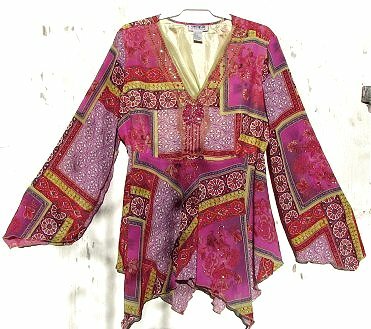 The flowy polyester fabric contains various shades of pink and fuchsia, purple, mauve, pale chartreuse, gold glitter and deep fuchsia or maroon beads around the neckline with a beaded and sequin spray in between the breast area. The chest area will easily fit a size 48" chest so I believe the blouse is a roomy 2X or a 22. The generous chest area is lined. The blouse is made of a very flowy thin polyester that moves well. There is a hidden zipper on one side. The eye catching blouse goes well with dark jeans. It does have a bit of black in it so it could be worn with black or purple pants too. It should be hand washed since it is delicate, but it should not shrink at all.